Remembering When™ gives you an easy-to-implement way to teach active seniors how to avoid fires and falls. NFPA® will print and ship the curriculum on demand! Get all the full-color presentation materials and backup you need to conduct a safety program for older adults in your community. 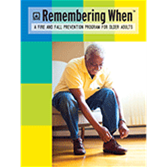 Remembering When: A Fire and Fall Prevention Program for Older Adults was developed by NFPA and the Centers for Disease Control and Prevention (CDC) to help older adults live safely at home for as long as possible. The program is centered around 16 key safety messages -- eight fire prevention and eight fall prevention -- developed by experts from national and local safety organizations as well as through focus group testing in high-fire-risk states. It targets a range of older adults and is meant to appeal to active seniors. Save on printing costs! NFPA will print and ship the complete Remembering When program upon demand. For a nominal fee, we'll print out all 106 pages in full color and ship them to you. You'll be ready to implement the entire refreshed version of the Remembering When program. Materials include the full curriculum including handouts and tips for making group presentations and home visits. Request your high-quality color printout of the Remembering When program today.